There is nothing better than giving your child the best start in life and giving them the opportunity to develop confidence and present themselves to the world with courage and pride. That's why you should enrol into one of our many performance classes in Auckland. 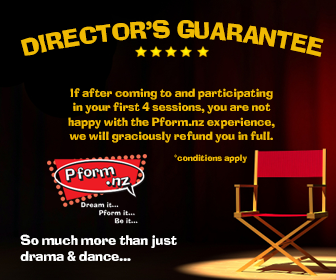 At Pform.nz we teach a variety of classes for children aged from 4 to 13 which includes drama, dance and other performing arts in Westmere and all around Auckland. Our tutors Anna & Josh aim to inspire your kids at her classes and you will find her on site every Friday in Studio 2 Room 10. Anna & Josh will be there from 1.30 through to 4.30pm on Fridays. You can contact us for more information or book our PFORM @ SCHOOL programme online now to secure a place. Our 1:30pm-2:15pm class is now for 6-8 year olds. If your child has just turned 8 we encourage you to enrol them in the 1:30pm class. Our 2:15pm-3.00pm class is for 8-10 year olds. If your child is over 8 and a half we would like them to enrol in the 2:15pm class. Our After School class is 10-14 year olds. If your child is close to turning 10 we would like them to trial the after school class. We look forward to seeing you on Fridays!